Derry City manager Kenny Shiels believes Shamrock Rovers have cherry picked some of the best talent in the League of Ireland. The Dubliners, who have former Republic of Ireland striker Robbie Keane currently training with them, have signed a host of top players - Ronan Finn, Darren Meenan, Paul Corry, Roberto Lopes, Ryan Connolly and Michael O’Connor - during the close season - a clear sign of their league title intentions, according to Shiels. “Shamrock Rovers are a very good team, they have had huge investments and challengers for the title and that will bring a little bit of pressure to them,” he said. 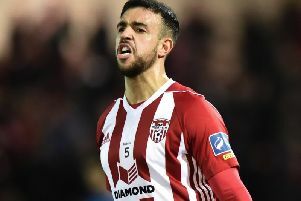 “When you bring two of Dundalk’s best players, a player from Sheffield Wednesday, you bring in Roberto Lopes, the captain of Galway, Ryan Connolly - they have cherry picked and you can see what they have done and see where they want to go. City will be without trio Conor McDermott, Ben Doherty and Rory Patterson for tonight’s game at Tallaght and Shiels is hoping their replacements and defensivesystem works out. “We have got the three injuries to key players - Conor McDermott, Ben Doherty and Rory Patterson - so that’s going to be a big challenge for us,” he added. “We’ll go down there without them and see how things develop, whether I make a mistake or not, we have to try and make the right decisions in selections and so forth. After last week’s derby win over Bohemians, Rovers’ Tallaght pitch was in very poor condition, something which Shiels is hoping will have been improved. Quickly following this evening’s clash is another big game for City against champions Dundalk, which takes place at Maginn Park, on Monday night. Derry City manager Kenny Shiels and his squad pictured at the launch of their new shorts sponsor Mintbet. “We are the most technical team in the league, no one can argue with that. We aren’t the best team in the league, but we are the most technical, so if we get good pitches we’ll do well, we’ll play well, we’ll entertain and most times we get a result,” stated the Derry gaffer. “I’m sure Rovers will have the ground staff working on the Tallaght pitch and I think the pitch is going to be good and I’m hopeful that we can perform on it. Meanwhile Mintbet, who are a newly set up betting company (rebranded from McBride Racing) became the first short sponsors in the club’s history. “We are delighted to have Mintbet on board as our shorts sponsor. Not only are they a local company supporting their own but it is a first time that the club has had a short sponsor,” said Orlaith Meenan, Derry City Commercial and Marketing Manager.